This is a snippet from our Acoustical Design in Modern Architecture course. This course is approved for HSW credits nationwide. Using basic concepts of acoustics, there will always be three basic ways to attenuate or reduce sound. If possible, we can replace sources of sound with others that produce less noise. In a similar approach, we can locate sensitive spaces further from generators of noise, to lessen the acoustic impact on them. We can block sound from reaching a receiver with heavier, more massive materials and barricades that are less affected by the kinetic energy of sound waves. We can interrupt the path from source to a receiver with light and absorbent materials to absorb the energy of sound waves. This seems extremely simplistic, but while selecting a site for a project, some attention should be given to what is nearby, what kinds of sounds can be expected due to proximity to what generates them, and whether such sounds are acceptable or would need to be blocked or lessened. If the site is large enough, locate structures far enough from noise generators, that sound waves have time to spread out and weaken before striking the enclosed spaces. Each doubling of distance from a source of noise lowers its sound level by 3-6 dB. If possible, lessen or block the objectionable noise at its source. An example would be an enclosure, built around an auxiliary power generator on site. Use dense screens of evergreen vegetation to help dissipate and absorb the kinetic force of sound waves entering the site. While these are not highly effective, they help somewhat and are aesthetically pleasing. 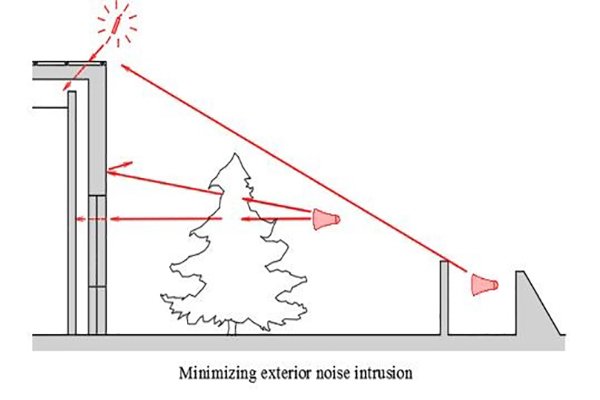 Use low walls or earth berms to deflect or totally block the kinetic force of sound waves entering the site. Redirect kinetic energy up, over or around the building. This is the function of concrete walls used to separate highways and high traffic streets from adjacent neighborhoods. Such barriers may not have openings and must block the line of sight between noise source and receiver, to be effective. The best that can be hoped for from such barriers, is lowering the sound level by 10 dB. Block exterior noise that transmits sound by using the wall as a diaphragm. Use enough wall mass that it uses up a great deal of acoustic energy to vibrate the outside enclosure assembly. For example, tilt-slab concrete exterior walls block far more sound from nearby trains, than sheathed steel stud framing. More sound solutions next week! This entry was posted in Architecture and tagged Acoustics in Architecture.